"Three powerful white lasers draw rapid successions of ephemeral objects, seemingly floating in space. The data used to draw the shapes is transformed into audible frequencies. Laser patterns and sonic treatments are performed as an improvised dialog between the artist and the audiovisual machine. Lumi�re is an exploration of synchronicity and divergence, of light and darkness, movement and sound at the limits of perception." "The lasers are controlled with analog signals, created in MaxMSP. These signals are technically the same type of signals used for audio, but they serve a different purpose and are usually not intended to be made audible. They rather control the movement of extremely fast and precise mirrors and the intensity of the laser beams and by doing so allow me to draw lines, circles, complex morphing shapes or even text and numbers." "Three laser beams cut through the room and form geometrical shapes � floating, ephemeral, divided by frequencies. Robert Henke is at the computer behind that, controlling the interaction of shape, colour and music. 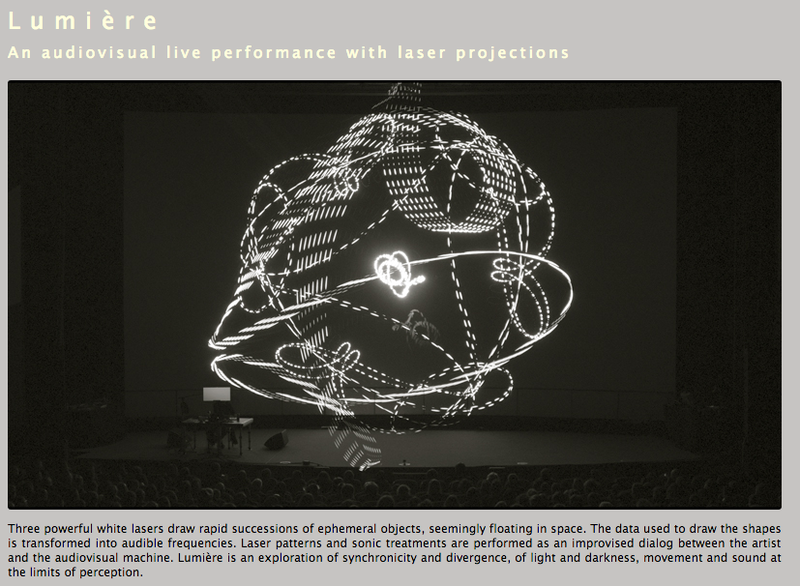 He is working on Lumi�re, his new project, for which he is painstakingly teaching lasers to dance. For Henke, the visionary and mediator between engineering science and free-spirited art, it is not the first project of this kind: In the early nineties he co-founded Monolake with Gerhard Behles, exploring the varieties of electronic music. As the co-founder and developer of Ableton he revolutionised music production with the Live software. Since then, he�s also been working on the spectrum of audio-visual art under his own name. 6sept13 visited Robert Henke while he was developing Lumi�re. The result is a portrait between his past, present and future. 30dez13 - Robert Henke (english subtitles) from 6sept13 on Vimeo.